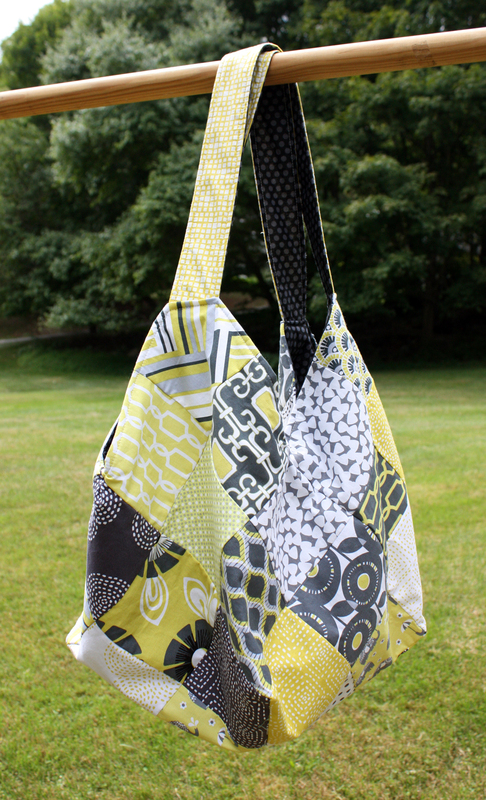 A member of my local modern quilt guild showed off her Mondo Bag (a pattern that is purchased as a kit through Quiltsmart). After coming off completing two Queen sized quilts, I wanted a quick project (finished this in a couple evenngs). I also wanted to use a charm pack that I picked up recently. I was short of the amount of required fabric and I wanted to play around with scale (the squares in the Mondo Bag are about 2.5″, my charm pack was already pre-cut for 5″ squares). I studied what I could find online about the Mondo Bag and adapted/came up with my own pattern. Voila…. the voluminous bag. It’s slightly smaller than the Mondo Bag. I think another slightly larger version is in my future! It was a lot of fun to make.